Imagine you’re wandering through town, minding your own business when a naked horse-riding lady comes galloping past - even on a Friday night it’s fair to say that would be a bit of a shock! Well Pragmatic Play have been inspired by the world’s most famous naked horse rider to create Lady Godiva new online slots game, an enjoyable and entertaining game. There’s wilds and scatters, plenty of fun and intrigue and lots of top prizes on offer. Since 2015 Pragmatic Play have been evolving quality online games from their Malta base. Known for their 5 reel slots, players of all ages and experience levels are entertained by their titles in online casinos worldwide. Pragmatic Play games take their inspiration from a variety of themes, granted they are not always the first developers to have produced games related to these themes, but you can rely on them do to put their own twist on things and throw in some interesting features and bonus rounds to keep you on your toes. Get the best out of our online slot bonuses before you play the game! 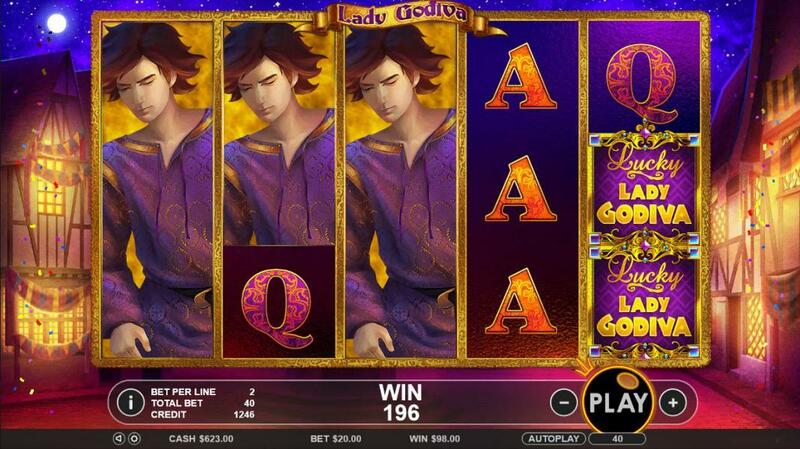 Lady Godiva, a 20 payline and 5 reel slot from Pragmatic Play is set in a Middle Age town, the moon is shining, there’s a celebration occurring, it’s a pleasant backdrop against which to spin your reels. When you are ready to start the action all you need to do is select your bet, you do this by choosing the wager and the coin value, then hit play. You’ll be looking to line up 3 or more of the same symbol on your reels to start the prizes tumbling. You’ve got your traditional playing card symbols, these pop up frequently but the payouts are fairly low. The themed symbols will bring you greater rewards, these come in the form of a horse, a prince, a boy and the star of the show Lady Godiva. The good thing with this game is they also can pop up as stacked icons, this occurs randomly and they then multiple to occupy their entire reel – making it more likely you’ll land a big win. As well as the beautifully drawn character symbols there are also some special symbols you hope make an appearance. The game logo acts as the wild and it takes the form of a traditional wild and can replace any other symbol to create a winning combination for you. Next up is the scatter, if you bag yourself 3 or more these anywhere on the reels you’ll get yourself some handy free spins. 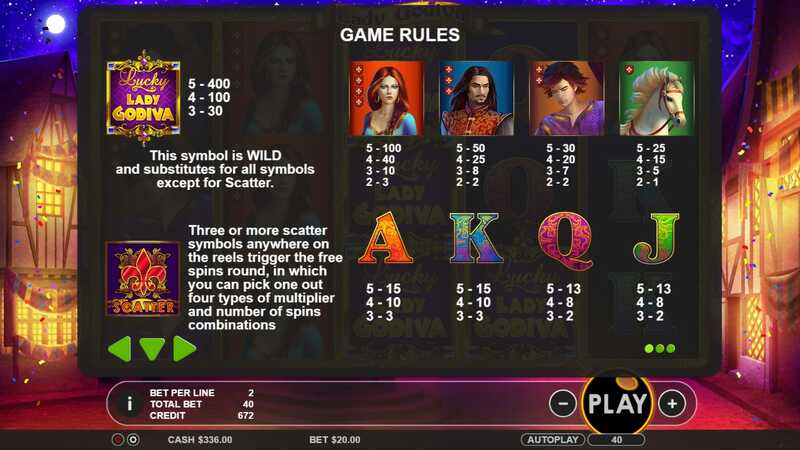 You can choose between different combinations of amount of spins and multipliers depending on how you like to play.